The IK Yacht Design Company, with registered office in Florida, in the United States, specialises in the search for furnishing solutions for large yachts. As well as contributing to the design of interiors, the Company produces and proposes various very original furnishing elements. Among the many we found in the catalogue we have, we would like to signal a very special armchair, equipped with a seat that can be lowered, under which there is a minibar. 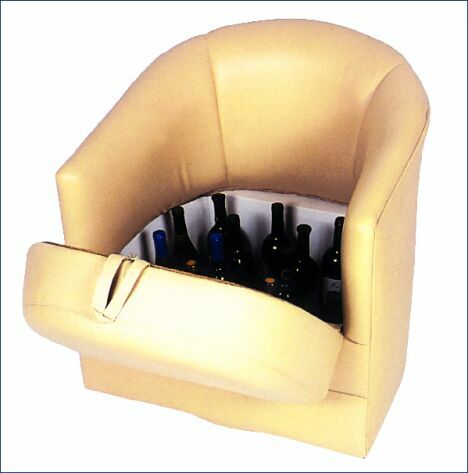 This accessory on its own is proof of the possibilities of IK Yacht Design in the production of custom elements for boats; the company designers in fact, are continually in search for innovative solutions like the minibar- armchair, or for example the saloon sofas with fishing rod racks or poufs with incorporated glass holders. As can be seen, creativity is an innate quality with IK Yacht Design and every owner can ask for or find that particular furnishing element that nobody had thought of before for a yacht. The minibar-armchair is compact in size despite the bottles being in a vertical position, the upholstery can be chosen by the client to coordinate with the armchair's future surroundings. There are different shapes of the Swivel Barrel Chair with Storage, this is the name of the armchair in question, to meet yacht owners' needs for both vintage boats, so with classic furnishings and also modern ones with minimalist furnishings or in any case modern tendencies. For further information on this American company's products, it is possible to visit their website at www.ikyacht.com, or contact IK Yacht Design Inc.; 809 North East 3rd Street; Dania; Florida 33004; e mail Orn22@aol.com.